Industrial enamel furnaces for large production volumes are typically equipment with conveyors and firing tools to maximize furnace loading efficiency and simplify product handling. 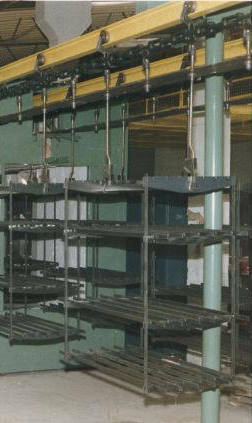 These furnace conveyors are usually mounted "overhead" outside the actual furnace underneath the roof support steel structure. For some specific applications, like baking ovens & cookware, so-called slot-in-bottom furnaces have been designed to enable fully automatic transfer of products from the application to the furnace conveyor. Overhead furnace conveyors are traditionally heavy duty Webb 3" or 4" type chain conveyors, although recently also cross-linked monorail type conveyors have been used. Power & Free conveyors many be used too, but require a reliable solution for connecting & disconnecting the so-called furnace shoe-plates, which seal off the slot in the furnace roof to minimize energy losses. The conveyor drive-unit should ensure that the conveyor moves smoothly (also at low conveyor speeds) to avoid that products fall off inside the furnace. This is even more important for a "powder enamel" furnace. The conveyor track should be equipped with an adequate number of expansion joins and a well positioned tension unit to compensate for eventual dilatation of the conveyor due to unavoidable temperature differences during operation. 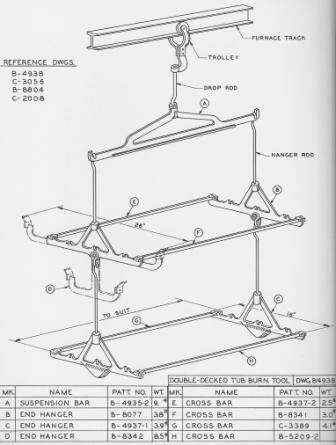 A drop rod ( a J-shaped hook made of heat resisting alloy, which hangs underneath the conveyor trolley), is the connection between the furnace conveyor and the firing tools. Whereas furnace & furnace conveyor components are very much standardized, firing tools should be design in relation with the specific requirements of your products. 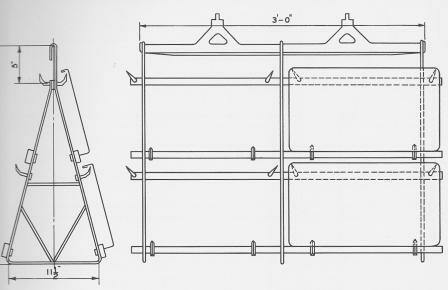 The sketch at the left hand side show a typical firing tool for cooker parts, which consist of one suspension bar, four end hangers and multiple cross bars. Firing tool may be cast or fabricated from a heat resting alloy with low wrapping & scaling properties. Typical alloy sheet comply with DIN 1.4841 or AISI 310, while cast firing tools are usually made of a NiCr 55/18 composition. Ditmer Trading & Consulting BV assist companies worldwide by providing knowledge and independent advice about porcelain enameling technology, plants & equipment. Visit our website at www.ditmer.nl for more info about our B2B services and our contact details.